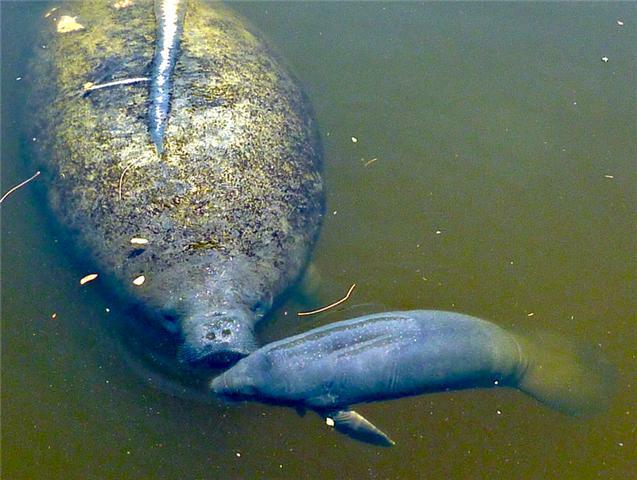 My friend Ron Mayhew sent me these photos of a mother manatee and her newborn calf that were exploring his St. James City canal at the southern tip of Pine Island yesterday afternoon. Although they're listed as an endangered species, the west indian manatee is a very common site in this area. It's not uncommon for us to come across dozens of them on a daily basis while we're out fishing the flats. They routinely swim right up the canals in search of a drink of fresh water from a dock hose. Manatees in Florida have no natural predators, and at the same time no fear of people. This is kind of ironic since boat collisions are a common occurrence, even though they're rarely fatal. The large white stripe down the mother's back in the top photo is the result of being run over at one time in her life. 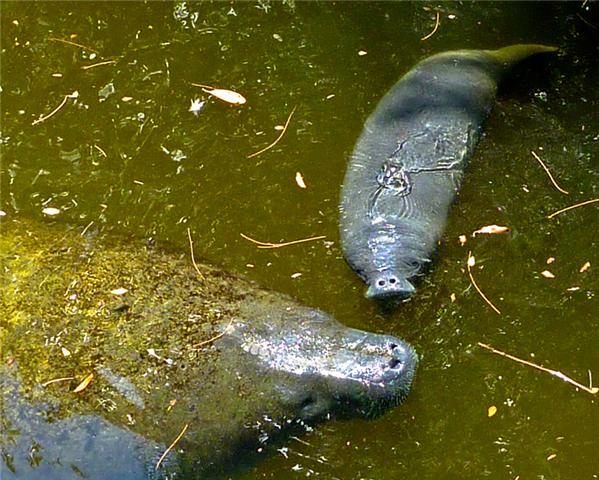 In fact, I've never seen an adult manatee in Florida that didn't have some scarring on its back. It's sad to see these wounds but the manatee's elephant-like hide and thick layer of fat protects them quite well. The pristine condition of the baby in these photos shows how extremely young it is. Seeing these gentle vegetarians is one of my favorite things about being on the waters around Pine Island.